Flavonoids, like hesperidin and diosmin. Used For: The herb is known to relieve spasms, induce expectoration, promote perspiration, treat nervous disorders, relieve inflammations, eliminate flatulence, treat liver problems, and induce menstruation. 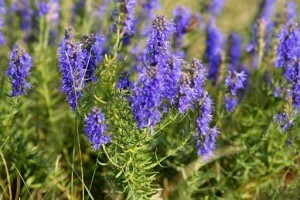 Hyssop is primarily used due to its outstanding capacity to relieve spasms. It is thus taken for recurrent catarrh, bronchitis, and coughs. Due to its nervine properties, the herb is applied in petit mal, hysteria, and anxiety. As it is capable of inducing perspiration, the herb is applied in common colds. Preparation and Intake: To prepare an infusion, take 1-2 teaspoons of dry herb extract for a cup of boiling water and steep for ten to fifteen minutes. The result is taken thrice per day. In form of tincture the herb is used at a dose of 1-4 ml thrice per day.